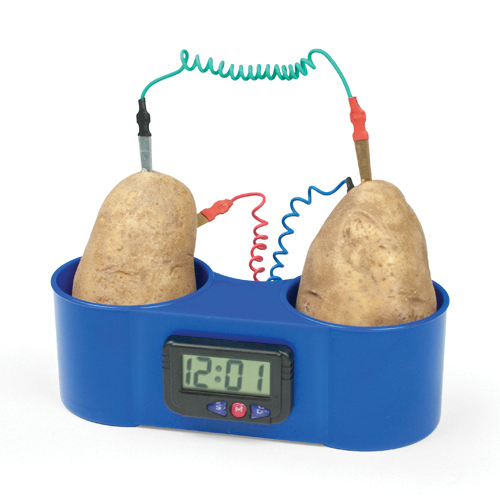 That just prompted me to Google how to make a potato clock. How interesting! I wonder how long it would run? Available at Walmart and Hobby Lobby. It looks like they recommend Idahos...also in tomato and apple powered varieties . For heaven's sake. They took the fun out of rounding up the stuff to do the experiment with! All you have to do is provide a couple of spuds! And I thought the wires worked better the further apart on the potato they are stuck in. That said, I'll probably hunt all through Walmart looking for this toy the next time I'm in! Remember that you will need galvanized nails since they are usually coated with zinc. If you can find some solid zinc the battery would last longer since it is the zinc that gives up the electrons. Sounds like you've built one of these, Tom? So I should look for galvanized nails, copper wire, and alligator clips. Yes, I remember making one of those in 4th grade about 50 years ago. Zinc is a common element used to help fight corrosion in systems that have seawater pumping through them and on the outside of ships and boats to protect metal parts that are submerged in seawater. Zinc billets are placed in areas where seawater flows so the zinc will corrode instead of the metal of the structure. The zinc billets are sacrificial anodes but sare commonly called "zincs" and are replaceable as the zincs deteriorate. Yes, grade 4 was a loooooong time ago for me too, Tom! I remember reading up on zinc and galvanized wire some years back when I was considering building some sort of large cage for my birds. They tend to use their beaks for climbing, and chewing wire of course, and can over-zinc themselves to toxic levels. Amazing what one can learn here at RB! Very sorry to learn of Leonard Nimoy's passing today. What a wonderful character he left us though! Spock will live on, and I think Zachary Quinto carries the torch very well. Yes, sad indeed about Leonard Nimoy. The Sheldon character in TBBT idolized him so I wonder how this will be dealt with. The death of the character Arthur Jeffries/Professor Proton showed that Sheldon does have some human qualities. However that was just a short story arc over a few episodes. The character was actually not mentioned at all until that story arc was introduced. Leonard Nimoy has been a constant presence from the beggining of the series. One of the funniest episode endings was when Penny gave Sheldon a napkin from the Cheesecake Factory that was signed and used by Leonard Nimoy. The restraining order from Leonard Nimoy apparantly has a place of honor on Sheldon's bedroom wall, next to the ones from Carl Sagan and Stan Lee. The passing of Mrs. Wolowitz/Carol Ann Susi was handled OK but Sheldon did not really have an emotional attachment to her. I looked back and see I missed your post about Mrs. Wolowitz/Carol Ann Susi's passing. It was a rather poignant episode at the end, and I suspect the entire cast was choking back tears. I found it very moving myself. Vairë wrote: Very sorry to learn of Leonard Nimoy's passing today. What a wonderful character he left us though! Spock will live on, and I think Zachary Quinto carries the torch very well. Well said, Vairë! I think Zachary Quinto does a fine job as Spock, and apparently, Nimoy and Quinto became friends while shooting Star Trek. He couldn't get a better recommendation than this, I think. Some actors carry more impact with us than others, Paddy. I was always intrigued with Spock, but had quite a crush on Captain Kirk in my youth! I followed the Star Trek series, all of them until "Enterprise" which I didn't like at all, all the movies, enjoyed Leonard Nimoy in "Fringe", but knew this day would come when I realized he and Shatner are now in their 80's. I dread the day Ian McKellen departs this Middle Earth. His Gandalf has made a huge impact on me, mostly because of his uncanny resemblance to my Dad. Dad didn't have that long a beard or hair, but there are similarities that have endeared Gandalf to my heart. Always loved the book Gandalf too, but McKellen's version is spot on for me! I agree, Vaire. For me it started with Jonathan Frid - whom I did get to meet and tell how he got me interested in 'Shakespeare'. He was very pleased to hear that, and I'll never forget it. Leonard Nimoy had such a time with Spock - what with the now I love him, now I don't books - and his obsession with the Van Goghs (he was the original fanboy - I am not kidding. He had it bad, really bad, for quite a while.) And even though 83 is a perfectly respectable age, it still came as a shock because it was so hard, at least to me, to divorce that character from the man; Vulcans can easily make it into their second hundreds, and so why not a half-Vulcan, say, doing another twenty-thirty years at least ? When Laurence Olivier died, the world felt somehow smaller - this is exactly like that for me. Nimoy did a lot for a lot of people - hell, that show, Star Trek, that original series, with all of its not-so-buried references to the folly of prejudice (though women were still objectified - well, can't have everything) and it's international/interstellar crew will always be cherished. He's greatly responsible for a lot of what good there is post-Civil Rights - in an understated, never ballyhooed way - and I'm glad we had him for as long as we did. Oh yes, Shireling! Star Trek was a fabulous show for giving one hope for mankind, in so many ways! The notion that one day we could drop our differences in order to explore the galaxy for exploration's sake, not to occupy or conquer, to accept not only the races we have on Earth but the different beings we could find on other worlds, and to achieve all this without losing the concept of right and wrong and basic decency without a "religion" per se. "To boldly go..."! Gene Roddenberry had an amazing vision and the exact right cast to pull it off.